Female blue orchard bees construct their nests in existing holes or tunnels that meet general size requirements. 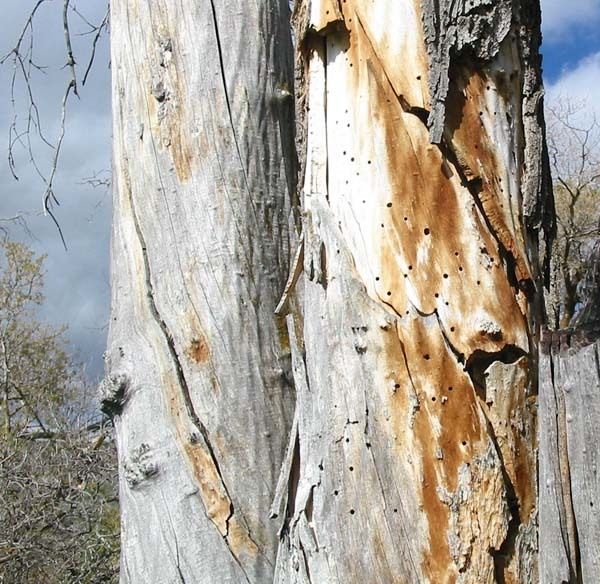 In nature, these tunnels are often created by larvae of wood boring beetles and other insects. These holes, often seen on standing dead hardwood trees where the bark has fallen away, are readily utilized by blue orchard bees. Narrow gaps and cracks in dead tree trunks are occasionally modified by the bees using mud filler to form suitable nesting tubes. Hollow plant stems are occasionally used as well. The standard size nesting tube used for blue orchard bee propagation is 6 inches (15 cm) long with an inside diameter of 5/16 inch (7.9 mm). The back end of the tube is closed off with a plug. 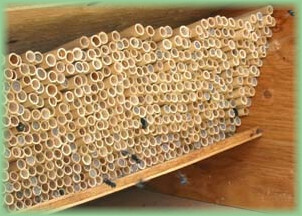 Artificial nesting tubes are generally made of heavy rolled paper and are often lined with a removable interior paper straw. Another popular nesting medium consists of a wood block that has had 5/16 inch diameter holes drilled into it. Nesting tubes cut from the stems of common reeds (Phragmites australis) offer many advantages over paper tubes and drilled blocks. 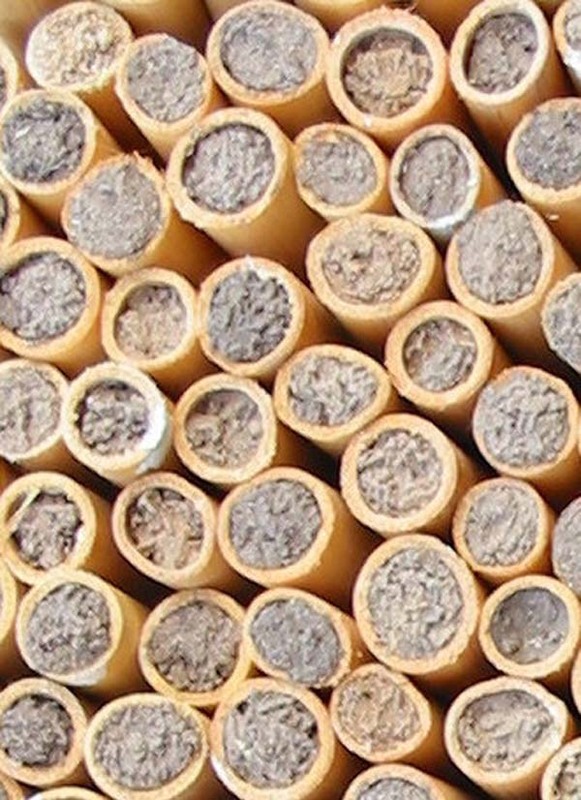 Reed tubes are easily opened and inspected without risking injury to cocoons inside. Being a natural plant product, reeds do not contain any chemical residues that can repel bees. Reeds are also impervious to an important orchard bee parasite, Monodontomerus, a tiny chalcid wasp that often wipes out entire orchard bee populations in straws. Located in the back of each reed tube is a semipermeable partition that permits the exchange of water vapor while preventing liquid water from entering the reed. 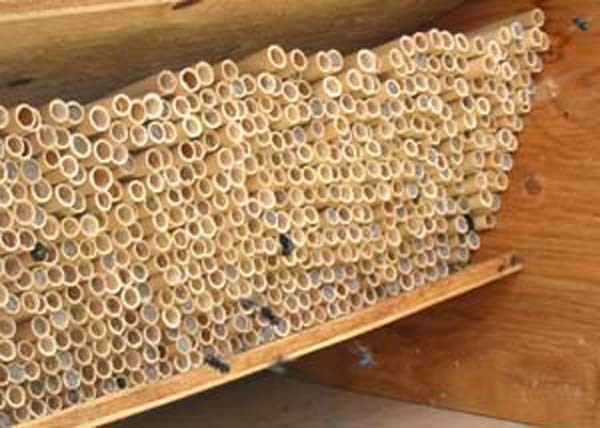 Air exchange throughout the length of the reed is important to prevent the buildup of mold inside the nests. Nesting tubes cut from reeds will naturally vary in size. While most female blue orchard bees select tubes with openings of approximately 5/16 inch, or 7.9 mm in diameter, many large female bees prefer a bigger tube while smaller individuals tend to choose narrower ones. A range in diameters from 7.1 to 8.7 mm (9/32 to 11/32 inch) will better meet the needs of virtually all the females. When given a choice in tube size, female bees typically produce higher ratios of female offspring than would occur in uniformly sized tubes.